Oak Trail is a gorgeous family neighborhood located near Belcher Road in Palm Harbor, FL. The entire community is an invitation to luxurious living. Homes for sale at Oak Trail are beautiful and spacious. They feature many luxury amenities such as gourmet kitchens, volume ceilings, custom windows, designer appliances, fireplaces, granite counter tops, and whirlpool garden tubs. They offer heated pools and spas outside, 2 to 3 car garages, and bonus rooms for media centers or home offices. Fenced yards are also available. Many have 4 or 5 bedrooms and well over 3000 square feet of living space. Select homes have formal dining rooms with coffered ceilings. Many have formal living and dining rooms as well as eat-in kitchens, snack bars, and wet bars. The master suites are large and comfortable, with plenty of room for a sitting area and separate tubs and showers. 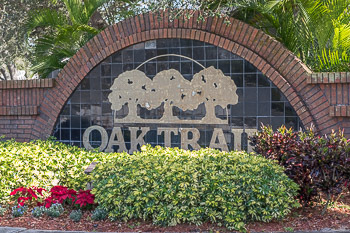 The Oak Trail community is convenient to US Hwy 19 and offers an easy commute to the Tampa area and the Tampa airport. You'll also be close to Gulf Coast beaches, great schools, and the beautiful offerings of Palm Harbor. This neighborhood is truly wonderful. Selling your Home in Oak Trail? Lipply Real Estate has been selling homes through out the Palm Harbor area for years. We are confident with our experience we can help you sell your home all while making the best possible sale. We are ready when you are - Our agents at Lipply Real Estate would welcome the opportunity to meet with you. Feel free to call us directly at 727-314-1000 or enter your contact information in the form below! We look forward to hearing from you.